Wants some shorts? Come check out these Riverdale high Bulldogs shorts. These women’s shorts are just made for all the fans of the Bulldogs football team from Riverdale. 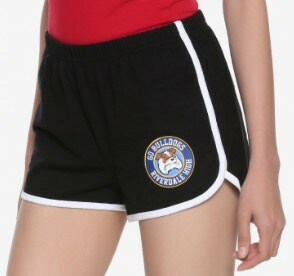 The shorts are black with white edges on the bottom and the sides and then on the front you can see a Bulldogs logo that shows the dog and the text “Go Bulldogs Riverdale High”. You can get these Riverdale shorts in women’s junior sizes XSmall – 3XL and they are made from 95% cotton and 5% polyester. Shorts like this are great for a warm day but if you like to wear them in winter then maybe wear them as lounge wear or maybe sleep shorts.